It may or may not be apparent that we spend a considerable amount of time away in the camper. I would estimate that we are away two months of the year, if not more, and since fitting solar over two years ago ( documented here) , it has made the time in the van a lot more flexible. We seldom used electric hook up (EHU), and this has saved us enough cash to pay for the original installation with money to spare. However, after some unreliability cause as a result of the original batteries failing in the last few weeks, its time to make some decisions about where we go next. I have been really happy with the original install, and if we had not had any issues I am sure we would have just carried on the way we have been. The limited size of the battery compartment behind the front seats means battery options are very limited. On top of this, any battery that will fit the aperture was never really designed to provide consistent power to devices like fridges etc during lengthy periods away. The more I researched it the more convinced I was that the original leisure batteries could only really last a couple of years in my configuration. 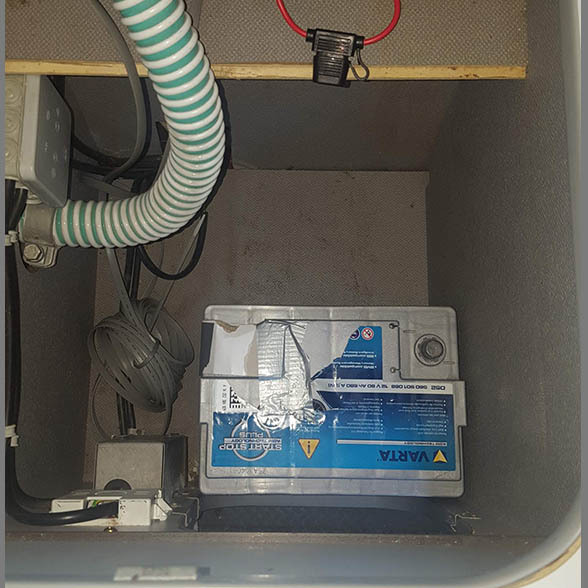 Deep cycle batteries are designed for continual usage of persistant charge and drain, but these are always going to be higher, if not longer or wider than the stock compartment would ever allow. So with this in mind, if I was going to push forward with my next generation solar solution, it was inevitable that the batteries were going to have to me stored elsewhere. Once I got my head round this I felt like my hands had been untied! I started stripping out the contents of the cupboards so I could really get to grips with the space I had available. I soon decided that the small lower cupboard next to the fridge was probably the most suitable location for the batteries, and the cupboard above that would be for the fuse box. Cupboard chosen for batteries is lower left of this photo. The small lower cupboard had a divider panel in which essentially separated the storage side from some of the consumer electrics ( RCD breaker switch, power socket and EHU and associated cabling and junction box ), so this needed to come out to free up some space. 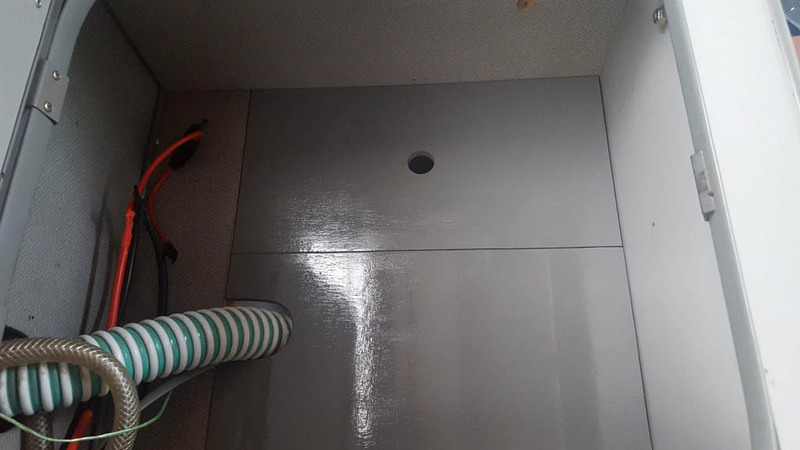 This is a photo of the lower cupboard with the divider removed. The battery is just for reference. It soon became apparent that the RCD and some of the cabling would also have to relocated if I wanted to run a two battery setup. 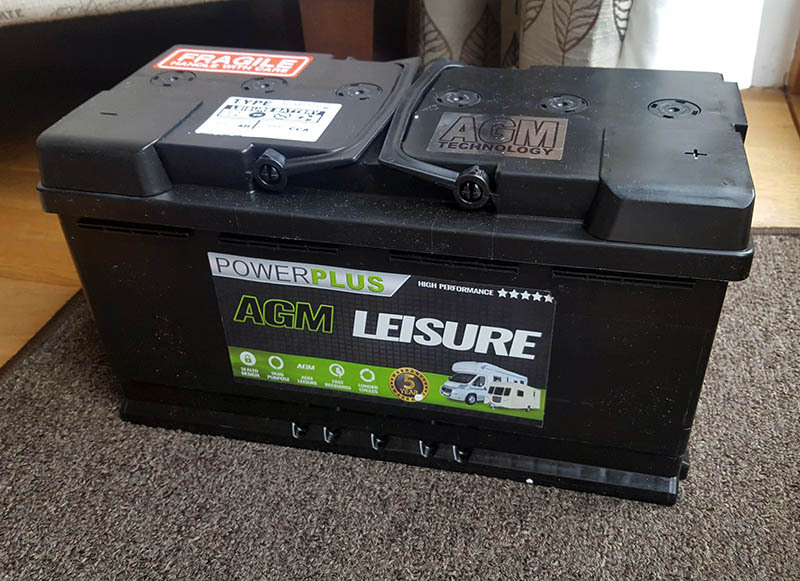 Once the cupboard was clear enough to get some measurements we looked online for the largest AGM battery that would fit the space and ordered it. 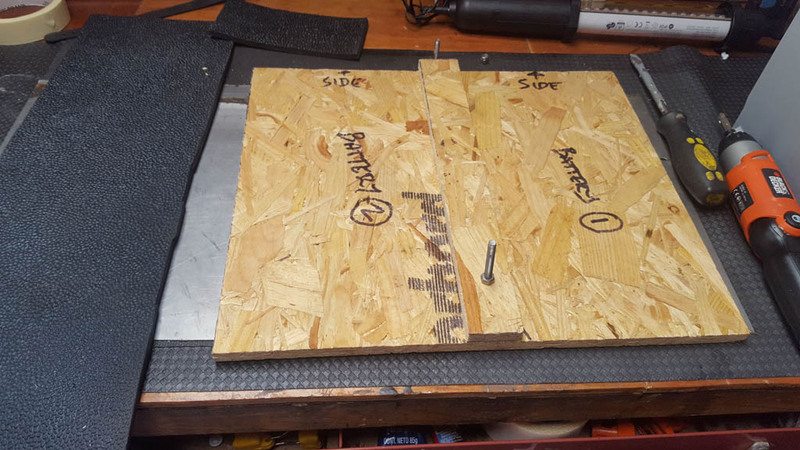 So I set to fabricating the base plate for the batteries out of a sheet of OSB I had lying around. 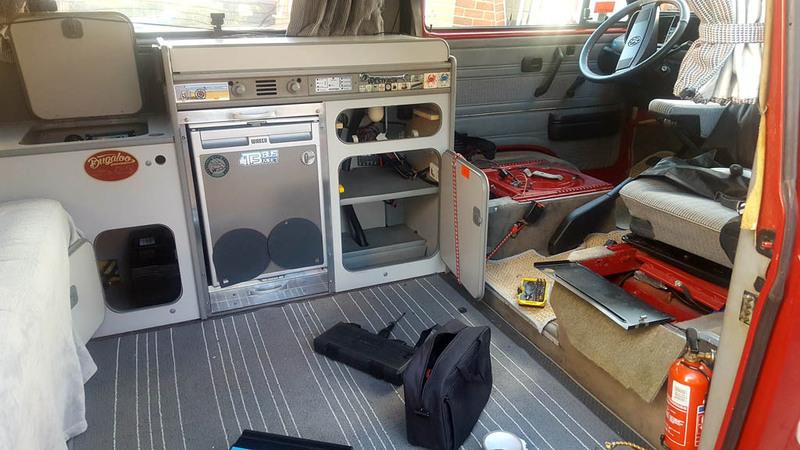 I wanted to do the whole install as sympathetically as possible, so drilling holes or applying fixings to anything that was an original component of the van would only be done as a last resort. Making a base plate for the batteries gave me an element of flexibility to be able to use this as a fixing platform for securing the batteries in place. It was cut just big enough to snugly fit in the base of the lower cupboard. From a previous project I had an excessive amount of thick black rubber matting, so I decided to place this on each side to create a non slip base. This picture shows both the lower cupboard divider and the upper shelf which are going to be put into storage in a safe place in case the process needs to be reversed. Left is lower cupboard divider. Right upper cupboard shelf which forms the cupboard base. Due to the fact the lower cupboard is going to be filled with batteries, and the installation of them can only be achieved effectively with access via the upper cupboard, placing the shelf back into its location afterwards will not be achievable in one piece. In one piece the shelf has to be dropped in at an angle to the lower cupboard space and juggled up into position. On top of this It will need an additional hole cutting in the shelf to allow access for cabling. So this is my reason for fabricating a new shelf. I chose to use 5mm plywood. This needed cutting to shape and bonding one on top of the other. Reason for not using 10mm in the first place is that I needed to create a lip that forms a resting point along one edge. Here it can be seen in place. And here after the cut is applied and the components are painted. Next is the relocation of the RCD and fuse box. I used a piece of 8mm plywood board cut to size for the back plate. I used two stainless M8 bolts to act as fixings for the RCD onto the back plane. The fuse box uses two self tapping screws. 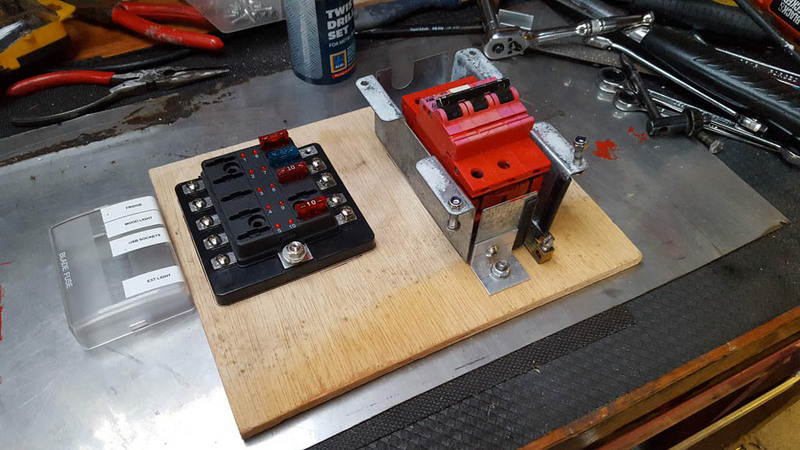 After some head scratching i fabricated the rest of the components to build up the casing for the RCD unit. These were then painted in grey enamel to match the cupboard base. It can be seen here offered into location. Still some way to go yet though. So I have the new battery and have pretty much fleshed out locations for all of the components in my system. 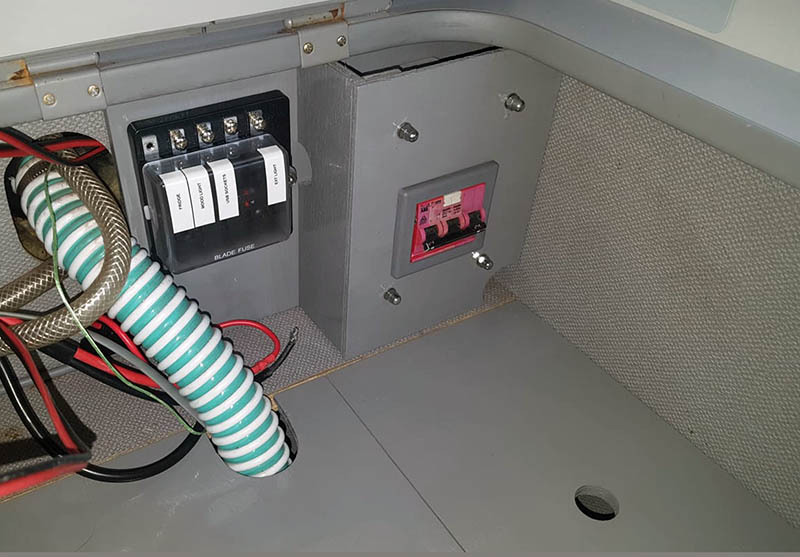 The original live wiring that goes to the old leisure battery location will need feeding back to the new battery location in the lower cupboard and connected to the battery. My original solar charge controller was a PWM (Pulse Width Modulation) unit. It had feeds for two batteries and came with a LCD display. However, it is fairly basic in its technology and only really acts as a switch filtering power to the batteries when the panels receive sunlight, and stopping drain at night. 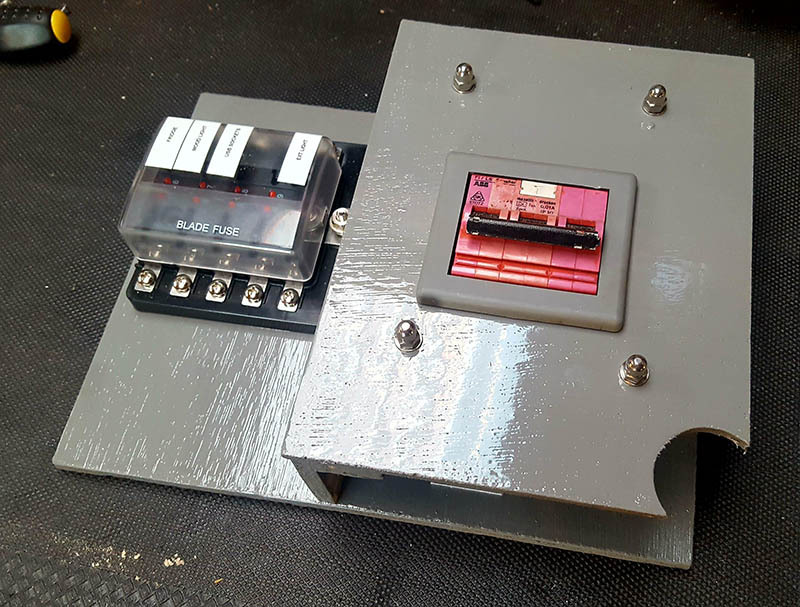 During my recent research into solar controllers I have come to the conclusion that I would probably benefit from moving onto the more expensive MPPT (Maximum Power Point Tracking). 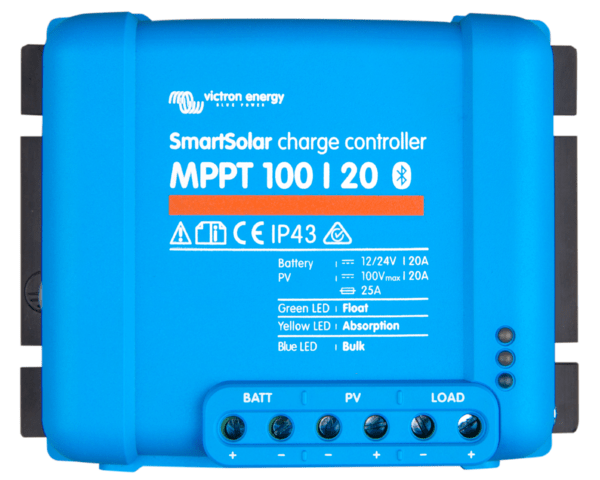 The MPPT harnesses the solar energy before sending it to the batteries much more effectively. The increase in power to the batteries can be 30% more efficient if figures are to be believed. Along with this efficiency, they seem to have a lot more intelligence and diagnostics available to draw from this type of solar controller. Monitoring using a smartphone via the installed application gives lots of analytics. 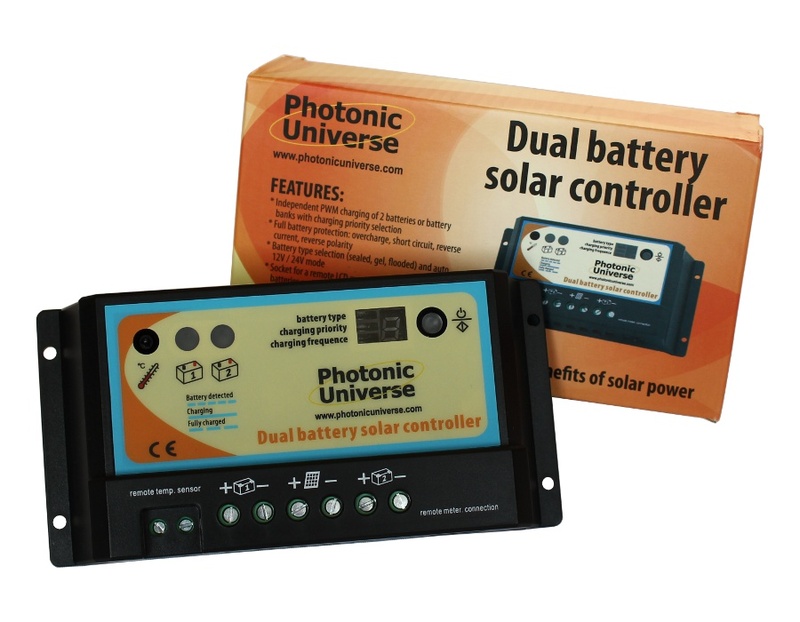 So in the next few days I will be placing an order for the above Victron Energy 100/20 , 20 amp solar charge controller with built in Bluetooth. This can be monitored by a phone app when within Bluetooth range. This will be positioned in the original leisure battery location behind the drivers seat. So I am looking forward to getting the rest of wiring completed ready for our two week break in September. On that note I will conclude for now by saying I will add more to this particular BLOG post as I move forward with the rest of the install to hopefully provide complete a guide to anybody that may be considering going down a similar route. 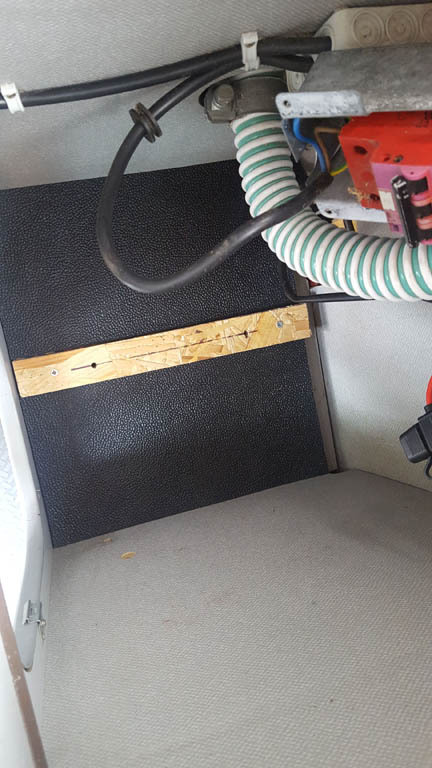 This was the second attempt at utilising the available space below the compressor fridge. 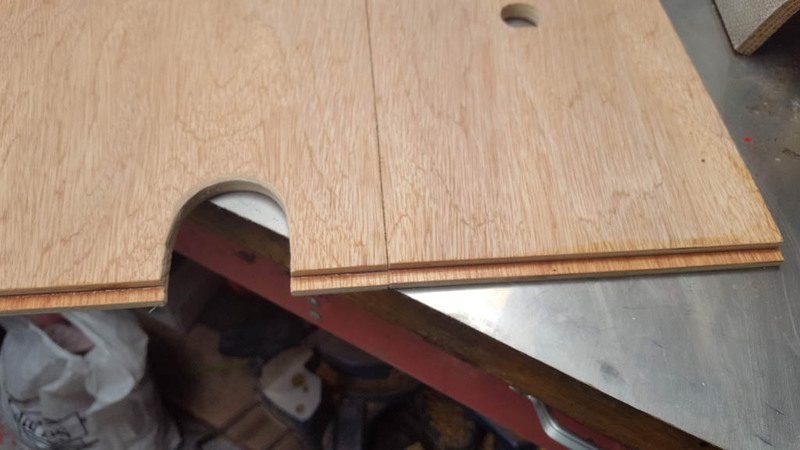 The first attempt was not brilliant and I kind of knew I wouldn’t be totally happy until I had a solution that was on a par with the chopping board. What I mean by that is the chopping board had a lot of time dedicated to it to make sure it worked and could stand the test of time. The first incarnation of the lower fridge draw was really just an alternative place to store stuff like batteries, fuses, headphones etc. Basically it was adequate, but not brilliantly executed. We were also having to make do with a flaky solution for our cutlery, which was a draw in front of the sink which has a large portion deeply recessed to make way for the sink waste pipe. Don’t take this the wrong way, I’m not having ago at VW or the coachbuilders Westfalia. They did the best they could with the components and space they had at the time. But things have moved on and I was going to make sure I took advantage of this. So with all of the above in mind I set to relieving the already crowded cutlery draw by relocating below the fridge. This meant that the fridge had to come out along with its shelve. I worked out the space I had to work with and started to look around for suitable parts. I knew that it would need to slide out a lot further than the chopping board so a pair of double extending draw slides were purchased from Screw Fix (UK). From there we took a trip to B&Q and found an amazing solution which would save a great deal of time in this project. Basically its a bamboo cutlery drawer that expands to fit different size draws in a domestic kitchen. 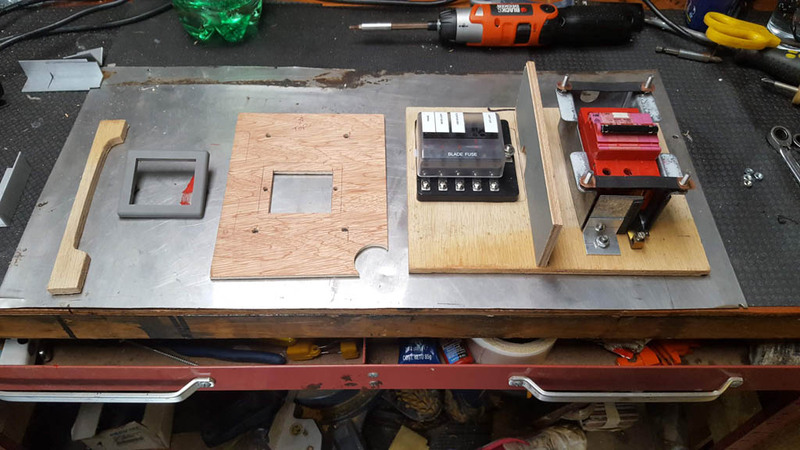 This worked really well as all I needed to do was mount the inner part of the hinge into each side of the cutlery drawer, and the outer part of the hinge on the inside of the unit. Simples! So this was all well and good, but I needed a front facia and handle. 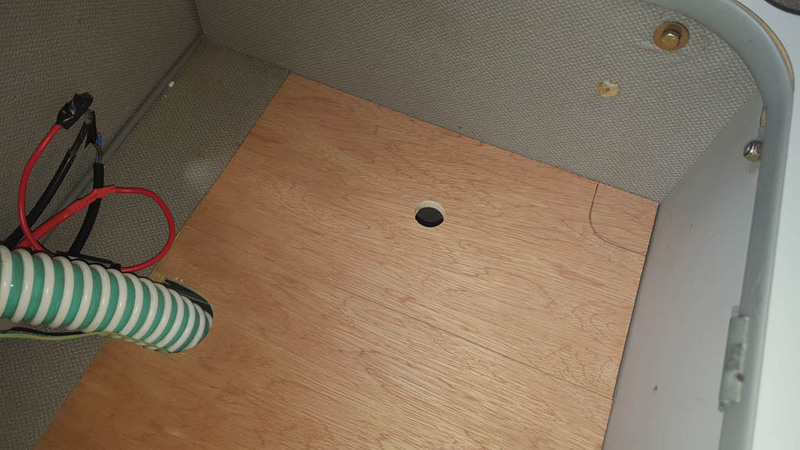 Fortunately the DIY suppliers provided aluminium angle extrusions that perfectly matched half of the depth of the drawer (See below as I measured for size). So I cut two pieces to the required width, drilled, countersunk and screwed one at the top, and the other at the bottom. Handle fitted to match the Chopping board. Red anti rattle foam dropped into the compartments. 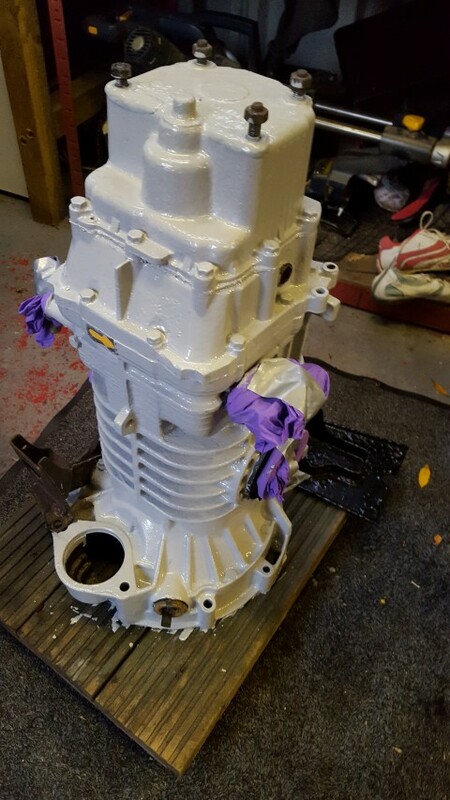 A little progress on the gearbox…Due to issues with a batch of faulty parts, the gearbox wasn’t ready for my September holiday. As has been covered in a previous post we managed to get away thanks to a friend lending me a box. Ironically, I received an email stating my gearbox was ready the first day of our three week break. Suffice to say I was not really in any positing to collect until the end of September where it sat in my garage until a couple of days ago. The box build spec changed from standard to include a 4.14 final drive, stronger 4 pinion differential and new differential bearings. This should compliment my new, more powerful AAZ engine with longer gears throughout and a higher cruising top speed. 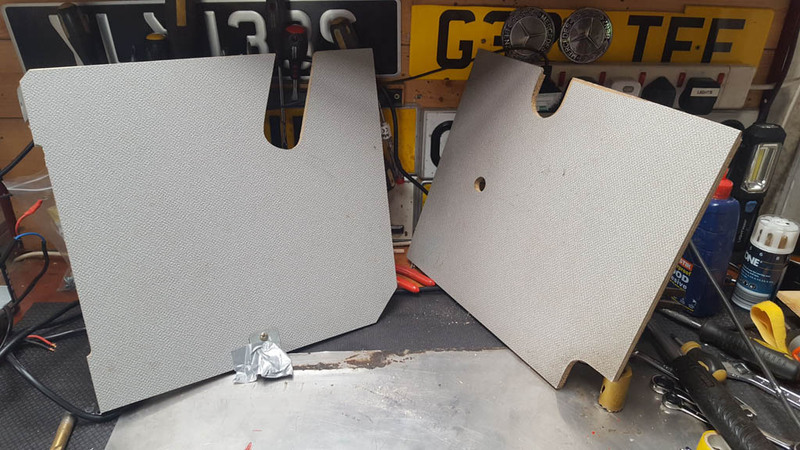 Knowing that the gear boxes are prone to corrosion due to its position underneath the camper in front of the engine, my intention was to paint the casings before fitting the box. I thought about etch primer (the yellow stuff that comes out of an aerosol can), but decided to try Hammerite primer on a small section of the alloy to see how well it adhered. After a couple of days I checked and it seemed to have keyed on really well, so the rest of the box was painted. 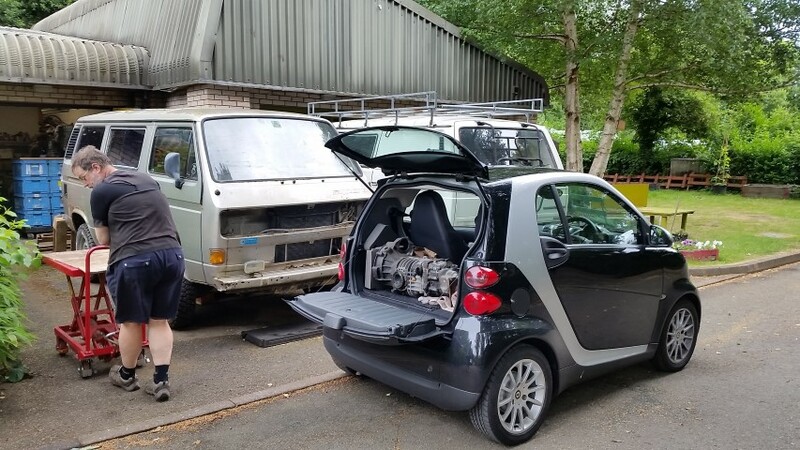 I am in no great rush to have the box fitted, and the reality is it’s probably going to sit in my garage for the next 6 month until my van is booked in for a service at Brickwerks. I’ll get them to fit it then 🙂 . Hammerite takes a good few weeks to cure, after which I will paint again with a mid grey engine enamel. 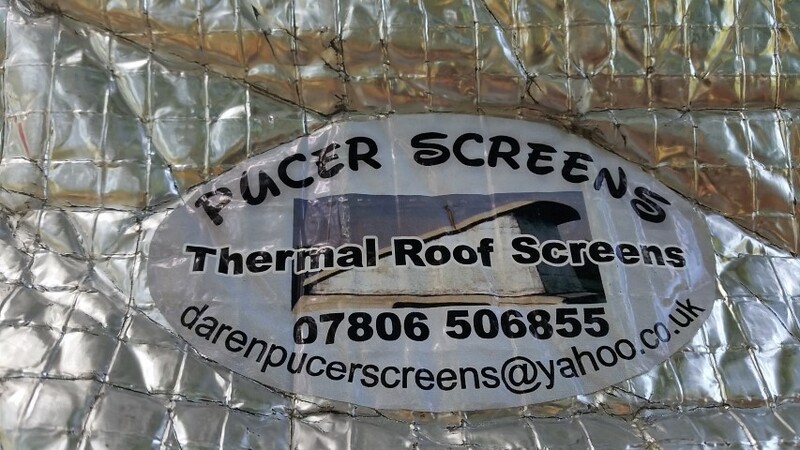 I have had a couple of people ask me about the thermal screens I use on my van (seen above on both the window and pop top). Both of these get used on almost every camp over oblivious to the time of year or temperature for reasons explained below. All T3 / T25s have glass window screens and door glass so a thermal wrap is a must if you want to stand any chance of eliminating condensation from the cab area of your van. The Silver Screen was an expensive purchase in comparison to the alternatives that are on offer from the likes of Just Campers etc. At over £100 it was twice as much, but my purchase is still as good today, as the day I brought it. You can definitely see the difference in the thickness of the quilting and the old saying ‘you get what you pay for’ certainly rings true here. 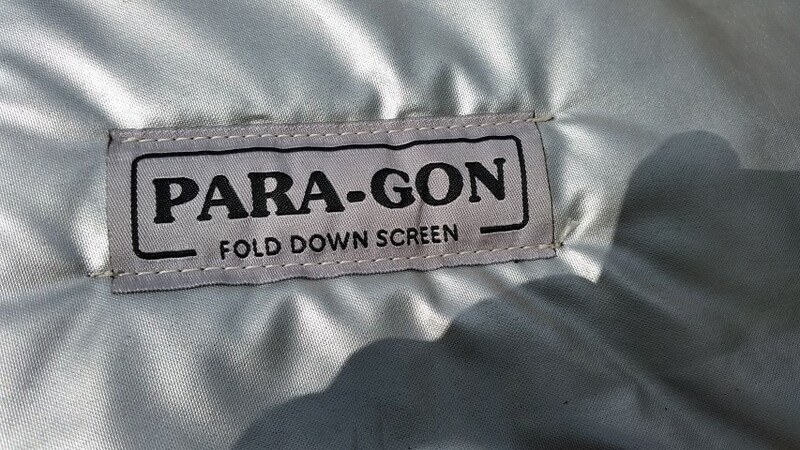 The screen cover was brought directly from Silver Screens ( www.silverscreens.co.uk ). 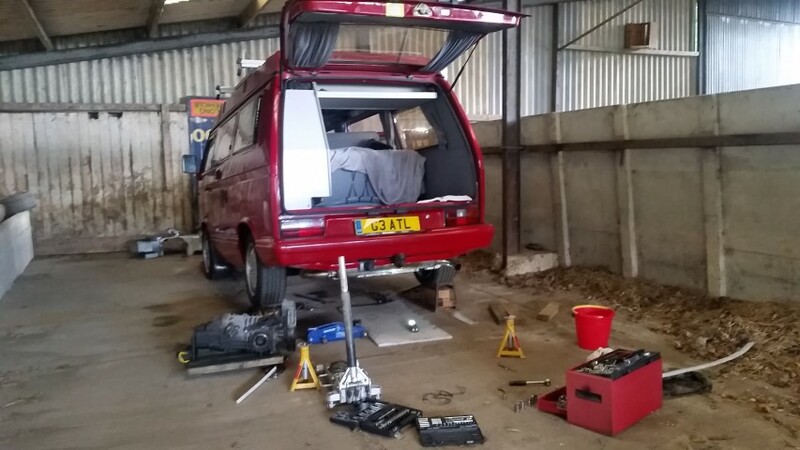 After the epic failure, and massive disappointment of not being able to have our dream holiday in the campervan back in May due to mechanical issues, the agony has been prolonged by restrictions on using the van over any distance until the gearbox has been replaced. A lengthy lead time of two months on getting my gearbox into the specialist left me feeling slightly frustrated, but mid July arrived and the box was delivered in person. 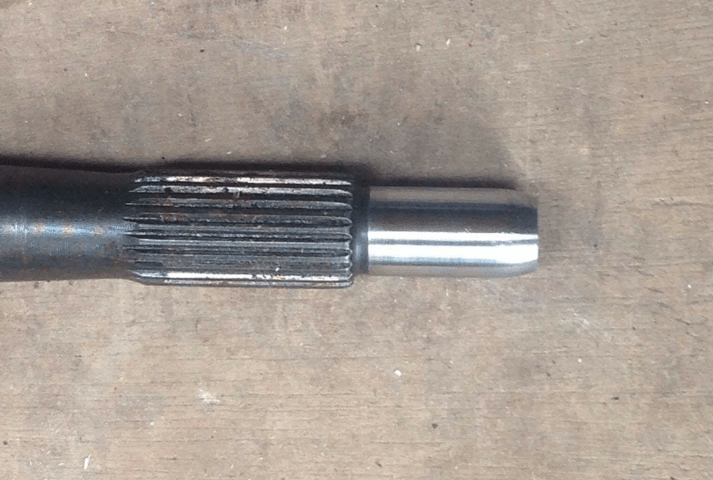 A month or so later and the refurbishment of my original gearbox seemed to be taking a lot longer than expected. Not exactly sure why but I’ve decided to take a friend up on the offer of loan gearbox to tide me over. I originally considered this option a couple of months previously to keep my van mobile in the interim but decided to wait. However, as my September holiday looms I have had to fall back on this as my only real possibility of getting my van roadworthy in time. Pulling a gearbox out and replacing with another would normally be something I would leave to the experts, but the tight schedule means no availability in the only garage I really trust to do the job properly. So needs must. I rolled my sleeves up and got stuck in. All be it a little reluctantly. 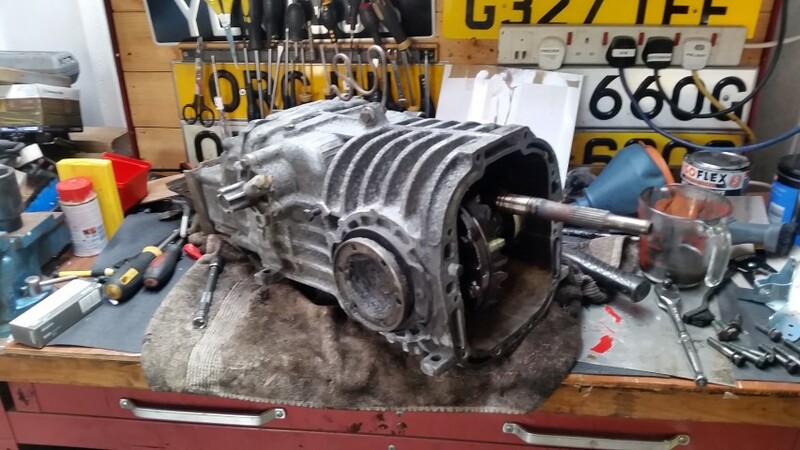 The loan gearbox was petrol, so there was always going to have to be changes made before fitting to my diesel van. The bell / clutch housing needed to be swapped over along with the input shaft. After draining the oil from both boxes I split the clutch housing from the gearbox. Then I proceeded to change the shaft. 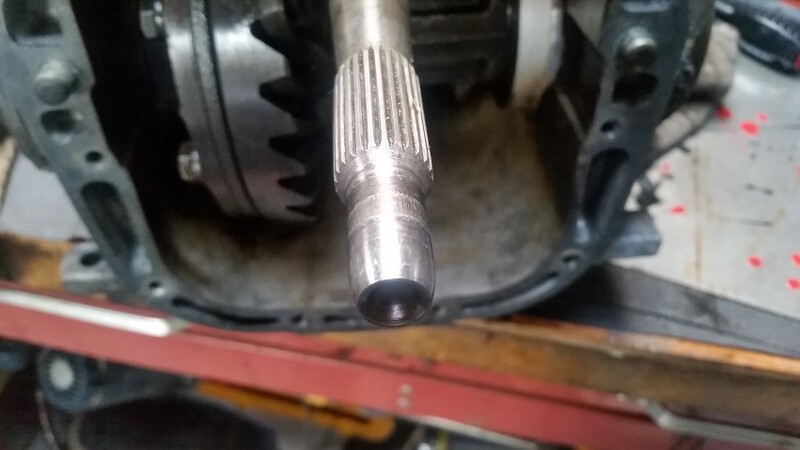 However, on close inspection I found the diesel input shaft to be pretty badly worn where it sits in the clutch spigott bearing. Clearly I wouldn’t want to jeopardize the next holiday by turning a blind eye to something I could rectify prior to fitting the gearbox. So I posted on social media to see if anybody had a replacement I could use. Within an hour or so I had a bite, and by the end of the day I had images as proof of the condition of a good replacement part.